Get the most from your car and the maintenance you put into it. Bring your car to Paramus Hyundai to keep your car rolling down the road and you happily behind the wheel. Tires are one of the things you know you are going to have to replace as you drive. However, what many drivers ignore is the maintenance you can do for your tires that will help achieve the distance they were rated for, and sometimes more. Ensuring your tires are properly aligned is one of the most effective ways to extend their service life. When tires are not aligned, they wear unevenly, reduce your gas mileage, increase stopping distance and more. Additionally, the added stress of improperly aligned tires can shorten the lifespan of other components, like brakes, control arm bushings and more. With the certified service techs at Paramus Hyundai, you can rest assured your car is being cared for by properly trained professionals who care about their customers. These technicians have not only received the appropriate training, but have the experience of performing repairs on all makes and models of cars each and every day. This is important because it means you will not have to worry about the job not being done properly. 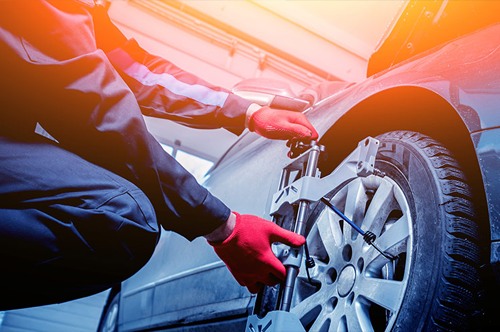 When it comes to aligning your tires, being even a little off can make a big difference in your car's performance and maintenance. You will receive a complete diagnostic check showing you the alignment before and after your service was performed, so you know your car is ready to hit the road one again. When parts need to be replaced, you have the choice of original equipment manufacturer parts (known as OEM), or aftermarket parts. When you visit Paramus Hyundai, you know you will receive quality OEM parts every time, which means there are no questions about the parts fitting correctly and operating at the specifications originally engineered. If the parts that affect tire alignment need to be replaced, even small variations in the specs of those parts can have big impacts on the alignment, and thus the wear and performance of your vehicle. You want to ensure that when you have work done that you are not inadvertently creating more work down the road by using substandard parts.